UPDATE: Be a #trueGIVER! Deadl.. Volunteers needed for Oct. 30 ..
NASHVILLE, Tenn. — Every dollar spent by Goodwill Industries of Middle Tennessee creates an additional $3.30 in benefits to the 48 counties it serves, and total economic impact of the not-for-profit is approaching a half-billion dollars. These are among the findings of a new study by the Business and Economic Research Center at Middle Tennessee State University, which also predicts a 66 percent growth in the local Goodwill’s employment impact. Within a decade, the organization is forecast to be responsible for an annual presence of 21,000 people in the workforce, largely through the efforts of its Goodwill Career Solutions centers and thousands of employer partners. Goodwill Industries of Middle Tennessee President and CEO Matthew Bourlakas joined the author of the economic impact assessment, Dr. Murat Arik, director of MTSU’s Business and Economic Research Center, in releasing the results at Goodwill’s Nashville headquarters Wednesday, Oct. 28. “This study validates what we have long suspected — that Goodwill is much more than a nonprofit and social enterprise. It’s an economic engine that propels businesses and communities forward while giving a hand up, rather than a handout, to those individuals who need it most,” Bourlakas said in a Goodwill news release. The 58-year-old organization serves half of Tennessee’s counties in a territory stretching from Cookeville to Union City. It is one of five independently operated Goodwills in the state. In 2014, the agency helped 9,558 people find jobs. The vast majority went to work with other employers in Middle and West Tennessee. The effect of those job placements — including salaries earned by formerly unemployed people, the impact of their spending and resulting sales taxes collected by the state — are included in MTSU’s calculations, along with Goodwill’s direct hires and salaries. Click the image for a full size pdf version of the full report. Goodwill accounts for $476 million in business revenue across Middle and West Tennessee. The organization is responsible for nearly 13,400 jobs across its territory, including external job placements and its own employees, which number more than 2,100. Goodwill spends about $77 million annually, while wages and salaries associated with Goodwill jobs and external job placements total nearly $277 million. This means each dollar spent by Goodwill creates $3.30 in benefits to local communities. Goodwill generates about $21 million in taxes and fees for state and local governments. In Davidson County alone, Goodwill annually generates wages and salaries totaling more than $100 million, creates business revenues of about $162 million and is involved in the employment of 4,200 people. While the nonprofit sector of the Nashville Metropolitan Statistical Area is dominated by giant health care providers, Goodwill Industries of Middle Tennessee still accounts for 11 percent of employment impact and 5 percent of business revenue impact in that sector. Goodwill and its mission results are expected to grow rapidly over the next decade and by 2024 are forecast to contribute to 21,659 jobs annually — a 62 percent increase over current employment impact. Total business revenue created or stimulated by the not-for-profit is expected to surpass $717 million by 2024. The assessment did not attempt to measure Goodwill’s many welfare benefits to taxpayers, such as reductions in unemployment compensation payments, decreases in the prison population through prevention of recidivism or curbed landfill use through resale of used goods, salvage and recycling. The BERC may attempt to gauge those benefits in a future study, Arik said. In 2013, the BERC and the Center for Nonprofit Management conducted an assessment of the entire Nashville MSA nonprofit sector, and in August, the MTSU facility partnered with the Nashville Health Care Council to release a study of the impact of Nashville’s health care industry. Burns Phillips, commissioner of Tennessee’s Department of Labor & Workforce, previewed the results of the Goodwill study. “The primary function of the Department of Labor & Workforce is to assess the needs of business and provide job-seekers opportunities for training that lead to employment. This approach has proven successful in getting the right person, with the right skill sets, in the right job at the right time,” Phillips said. He said he looks forward to an expanded partnership with Goodwill to achieve even greater employment outcomes for Tennessee’s citizens and business community. 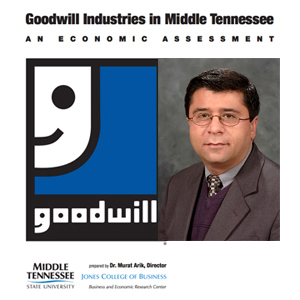 The complete, 65-page economic impact assessment of Goodwill Industries of Middle Tennessee can be viewed at www.mtsu.edu/berc/docs/goodwill.pdf. More information on Goodwill’s impact can be found at www.giveit2goodwill.org/annualreport. The MTSU BERC supports the public service activities of the Jennings A. Jones College of Business. The organization engages in a variety of educational and research activities aiding businesses, government, civic organizations and other interested individuals to help them understand the economic and business climate of Tennessee. For more information, please visit www.mtsu.edu/berc.